The Sanctuary Longhouse Restaurant and Bar captures the essence of the tropics with polished hardwood floors, high ceilings with fans lazily shifting the balmy air and a balcony situated perfectly to watch the sunrise heralded by a dawn chorus or a full moon appear out of the sea at sunset. Specialising in locally grown fresh foods and excellent coffee to satisfy your base desires, Sanctuary cuisine caters to all taste buds, carnivores and vegetarians alike. For those who can resist, well-equipped self-catering facilities are available. 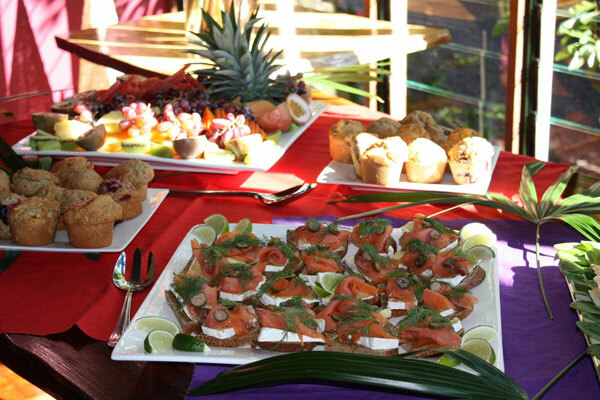 With the juice bar, fresh muffins and bar snacks available in addition to Breakfast, Lunch and Dinner, the relaxed atmosphere and home-made, delicious flavours can be enjoyed all day. Though words cannot describe the sensation of flavour, you can view a sample menu …or leave it to the imagination of your tastebuds and wait for the real thing. Breakfast ~ reflects continental styles with lots of home-baking. Lunch ~ includes loaded baguettes, wraps, pizzas and salads made to order with the freshest ingredients. 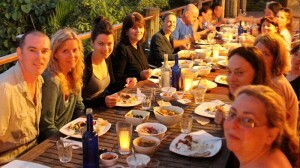 Dinner ~ daily changing menu encompasses styles from around the world. Dining outside under a brilliant canopy of stars is very fine dining indeed at Sanctuary. We also have a well rounded and priced range of beers, wines and spirits and a Juice Bar – Choose from our special fruit and veggie combos or make up your own.